Pores are the small openings in your skin. 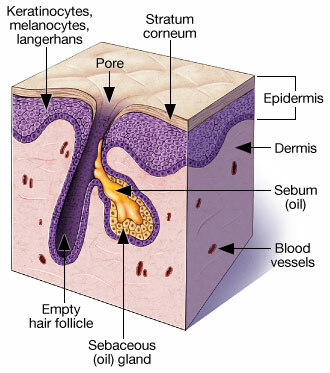 Hair follicles, sweat glands and oil glands end in pores. They provide a way for your body to flush out toxins, regulate temperature and moisturize dry skin. Skin texture is known as the overall appearance of your facial skin. Not everyone have the desired smooth and soft skin. It is also common to have both uneven skin textures and large pores. Having large pores can make the skin look old and rough caused by excessive dirt and oil build-up which eventually can cause acne. With normal oil production, the oil easily flows through the pore lining and out of the pore, imperceptibly spreading over the skin’s surface. The problems arise when your oil glands make too much oil. This excess oil mixes with other substances such as dead skin cells in the pore to form a clog. Not surprisingly, this clog makes it difficult for the oil to flow freely, which causes the pore itself to enlarge. Although it is not possible to close a pore but there are safe non-surgical treatments available to shrink the size of large pores, minimize its appearance and even out skin textures.